I am a reader. My husband is a reader. We have always wanted to raise children who love reading like we do. But, what’s the best way to teach them how to read? When we first started homeschooling, my oldest was five. We began using Teach Your Child to Read in 100 Easy Lessons. It worked fine for a while, but eventually it just wasn’t working for us. From there we tried other reading programs. My son continued making progress, but not as much as I knew he could. Eventually we made the switch to All About Reading, and his reading took off. That’s why I love All About Reading. I wholeheartedly agree with Mary that providing a literature-rich environment and enjoying good books alongside our children is key to helping them love reading. You may have read her recent post about why you shouldn’t teach your children to read. I’m one of those moms who prefers a structured, but gentle, plan to teaching my children to read. That’s why I love All About Reading. All About Reading teaches phonological awareness, phonics and decoding, fluency, vocabulary, and comprehension. You can add All About Spelling when your child is ready. This is a complete program for learning to read and spell. All About Spelling and All About Reading are designed to be able to work independently of one another. But we have found it helpful to have the same approach used for both decoding and encoding. The rules are stated the same. The review of phonograms and word cards is similar. We move seamlessly between our reading and spelling lessons. All About Reading and All About Spelling are based on the Orton-Gillingham approach. This method of teaching reading and spelling is especially helpful for dyslexic students, but is an excellent approach for all children. 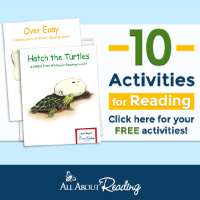 All About Reading is a multi-sensory reading program. Children see, say, hear, and touch during their lessons. It works for all learning styles. All About Reading Pre-Reading Level also includes the optional use of Ziggy the Zebra puppet. My kids had so much fun with him! Even though we have moved passed the Pre-Reading level, they still like for silly Ziggy to be part of our reading lessons. All About Learning Press provides you with what you need to teach reading to your children. Scripted. No guessing on how to teach lessons. Simple games and activities. No need for additional supplies. Reviews built right into lessons. Free lifetime support from All About Learning Press. I suggest you do all the prep work in advance so each lesson is open and go. Look for my Tips on using All About Reading coming soon. My children know they can pick up their All About Reading readers and read their stories with confidence. These are the go-to books for my youngest to read aloud to her grandparents, her stuffed animals, and the dog. ;) It builds her confidence to know she can read these books all on her own. Children know they are making progress. They track the lessons they complete on the provided progress chart. But more importantly, they master phonograms and words through the frequent reviews. Being able to read more and more words builds their confidence in reading. From the time I began looking for a reading program, I heard nothing but good things about All About Reading. But it looked expensive compared to other options. And I just wasn’t sure it was worth it. But my search kept pointing me back to All About Reading. So when I found out about the Go Ahead and Use It One Year Guarantee from All About Learning Press, I was sold. You can try All About Reading for a year and if it doesn’t work, All About Learning Press will refund your money. This guarantee provides peace of mind about your financial investment. And if you’ve ever considered All About Reading but had similar thoughts, let me ease your concerns. It has been well worth our investment. If you are looking for a program to help you teach your child to read, I hope you consider All About Reading for your homeschool. If you were looking for that nudge to go ahead and make the switch to All About Reading, this is it. :-) We started it mid-year several years ago with my oldest and have never looked for any other reading program. Here's to teaching our children how to read! Have you ever used, or considered using, All About Reading? Also, check out Tips & Tricks for Using All About Reading!